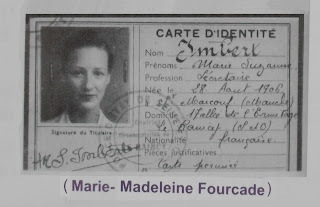 Marie-Madeleine Fourcade (née Bridou) was born in Marseille in southern France on 8 November 1909. 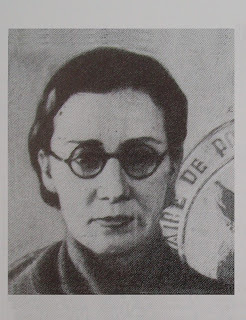 During WW2 she became responsible for 'Alliance', one of the largest and most effective French Resistance Networks which worked closely with the British Intelligence Service. She was briefly married at a young age to an Army officer but then attained her freedom and lived a largely independent life. It would provide the groundwork for her wartime activities. She remarried after the war, in 1947, to become Mme. 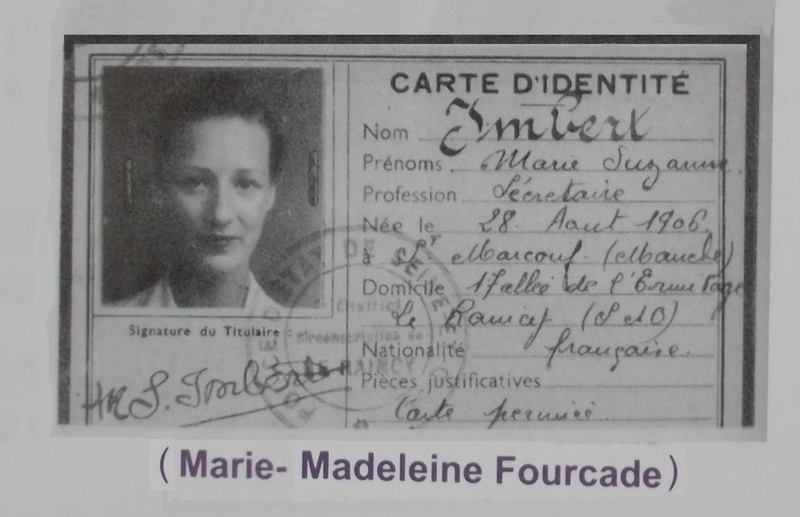 Marie-Madeleine Fourcade - the surname she used when publishing her memoirs. During the war, Marie-Madeleine became known to the Nazi occupiers by the code-name « Hérisson » ('Hedgehog'). Many of the members of this network were assigned animal names. It was the Nazis who gave the network the title of « l'Arche de Noé » ("Noah's Ark"). The Free French leader, General Charles de Gaulle, who Marie-Madeleine had first met in 1936, said it was " ... one of the first and most important intelligence services under the Occupation." The primary purpose of 'Alliance' or "Noah's Ark" was to gather information about German troops, naval movements and logistics within Occupied France. This information was then transmitted to Britain either by radio operator or courier. This was dangerous work and its members were constantly at risk of being captured by German secret police. Hence, it was necessary to regularly change their appearance and name on official identity cards. Three of the transformations used by Marie-Madeleine can be seen above (Photographs 1 - 3). As can be seen from these three photographs, this was done by various methods, such as hair style and colour, wearing or removing glasses, use of make-up, etc. In this way, it was sometimes possible to look 10 years younger or older than one's true age. Nevertheless, this was still extremely dangerous work. Many of the network were captured, tortured, imprisoned and executed by the Gestapo. 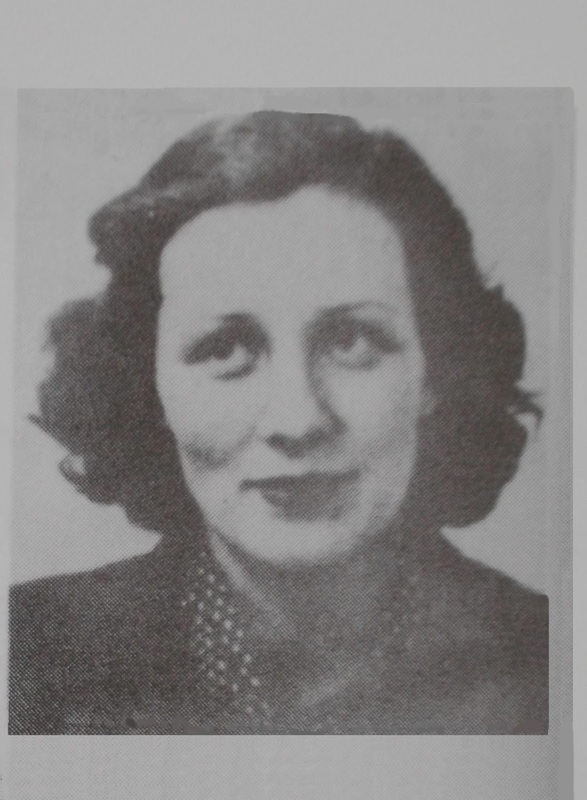 Marie-Madeleine was herself arrested twice in 1942 and 1944 - escaping on both occasions to resume her resistance activities. In 1945, Marie-Madeleine created the 'Alliance' Friendly Association (in French, the 'Association Amicale Alliance') and became its President. This organisation took responsibility for about 3000 members of the Resistance: some who had survived, to search for the 'missing' and provide social support where necessary. She also took on board the commemoration of the 429 members of the 'Alliance' network who gave their lives during the war. After her second marriage, Marie-Madeleine became the mother of 5 children. She was recognised for her outstanding wartime achievements - becoming among other honours a Commander of the 'Légion d'Honneur'. She was involved in the International Union of Resistance and Deportation and served as Vice-President for some years. In 1968, Marie-Madeleine Fourcade published the story of her Resistance network - using the apt title given to it by the enemy: "Noah's Ark". In her latter years she had a key role in the trial and subsequent convictions and subsequent convictions of Maurice Papon and Klaus Barbie. 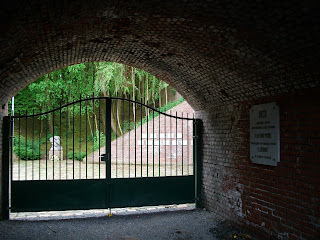 Many of the men of the 'Nord' department who were arrested for their Resistance activities were taken to the Bondues Fort to the north of Lille. After the Nazi Occupiers left the fort in September 1944 it was found that 68 of them had been executed in the central courtyard (Photograph No 4 above). The fort is now dedicated to the French Resistance of the north during WW2 and in particular to the memory of the 68 men of the French Resistance executed in the courtyard. Of these 68, approximately one third belonged to the 'Alliance' / "Noah's Ark" network. On 20 September 1986 the central courtyard was restored and dedicated to the memory of these 68 men. One of the principal speakers paying homage to these members of the French Resistance at the ceremony was the French war hero and post-war national politician Maurice Schumann (1911 - 1998). Another of those who paid homage at this ceremony was Marie-Madeleine Fourcade. « ICI en 1943 - 1944 des hommes ont DONNÉ LEUR VIE pour que tu puisses vivre LIBRE. N'oublie Jamais ».
" It was HERE in 1943 - 1944 that some men gave THEIR LIVES so that you can live FREE. Never forget!" This article is dedicated to the 'Alliance' / "Noah's Ark" Resistance network of WW2. « Ami si tu tombes, un ami sort de l'ombre a ta place » .
" My friend if you fall, a friend will come from the shadows to take your place". With grateful thanks to the staff at the Bondues Resistance Museum for assisting with the research for this article.